Screen printing isn't just dragging ink. There's a lot of software involved with a great print. What works to help one shop print shirts might not work for another. But if you look at the forums and groups that discuss it, there's common software debates that pop up again and again. It can be difficult to make the decision between one program and another! Every piece of software here comes with its own set of challenges. Each tool has a different learning curve. In the end, it's up to you to learn the programs so you can print shirts better. We'll discuss the different types of software (art & design, color separation, shop administration and shipping) according to price, difficulty, who it's best for and whether they're for Mac or PC. The first step in every shop’s printing process? Getting the art dialed in. Whether you have a dedicated design team on staff – or you’re just starting out and burning screens in your garage – finding the right art software is crucial to creating an awesome customer experience. If you’re on a shoestring budget, there’s always a service like Ignition Drawing. They offer low-cost vector creation, and will turn even low-quality JPEGs into flexible vector graphics. Be advised: using an art creation service over the long-term is very costly. Price: $240 annually. Available on a monthly basis for $21. Difficulty: Hard. Steep learning curve. Best for: Professional artists & designers. Creating vectors. Adobe Illustrator is the industry's leading vector generation software. It's powerful and widely used. Illustrator has a steep learning curve for beginners. But if you're serious about screen printing, there's a rich collection of videos and other resources available to learn Illustrator. You'll have to take the time to learn Illustrator like a true expert. The basics can be learned in a fairly short time. You don't need to be an expert to take advantage of Illustrator's vector capabilities to make better screens. The most common image format is a raster image. Raster images are specific arrangements of differently colored pixels. This means that as you zoom in or manipulate the image, you lose quality: the pixels become visible. Vector images don't use pixels. The image is encoded as the mathematical relationship between the shapes the image is made of. It's not made of the location and color of specific pixels. Images from Adobe's Help platform. Because of how well they can be manipulated, vector images are ideal for screen printing. Your screens will have well-defined lines and sharp edges, instead of pixels. It's important to note that you can use high-resolution rasters for printing. Difficulty: Moderate to high. Challenging learning curve. Best for: Professional artists & designers, shop owners, image manipulation, rasters. Photoshop is how Adobe made its name. It's so well-known that it's become a verb: "She just photoshopped that." There's a rich library of resources available for learning Photoshop. It's taught at colleges & universities and has been around for years as the internet's #1 photo editing suite. Photoshop is most powerful for raster images. It can create text and drawn shapes as vector elements as well. You can easily edit logos, photographs and colors with Photoshop. What makes Photoshop powerful for screen printers is the ability to separate artwork into different screens for printing. You can separate by color, adjust color channels, utilize halftones to plan for gradients, and precisely edit images for your prints. Anticipate that many customers will give you .PSD files, Photoshop's native file format. It's worth the cost for that reason alone. Price: $500, or available for a $200 annual subscription. Difficulty: Moderate to high. Customizable. Short learning curve to proficiency. Corel Draw is the vector illustration tool from the larger CorelDraw Graphics Suite. Corel nonetheless offers interesting features and a powerful color separation option for spot color printing. Its incompatibility with Mac can be a deal-breaker for artists, though. The separation process in CorelDraw is extremely simple: check one box (Print Separations) in the program’s Print options and jump straight into printing. Its price point is high, but you’re purchasing a robust package. You have to pay for upgrades ($200 each) unless you subscribe to their yearly update program. There’s no monthly subscription available. Some users of CorelDraw argue that it’s a more complete package than Photoshop or Illustrator, making it ideal for smaller businesses. Corel's software is highly regarded by its users, and there’s a robust community that backs it. If you’re not convinced by Adobe’s offerings, you should spend some time with Corel’s suite and see if it’s for you. You don't have to spend money to get a lot of value. Open source image editing software is still a viable option – provided you've got time to invest in learning new software. There's no paid support staff, so you're on your own if problems arise. Both of these programs do have a significant learning curve, with some users arguing they're harder to learn. There's also not as many people using these programs, despite how well-developed they are. Long the golden-standard for free image manipulation software, GIMP has a rabid community and thousands of plugins & extensions to make it infinitely customizable. It's powerful and well-known. Additionally, GIMP is compatible with hundreds of standard and non-standard image file types. GIMP is a raster editor. A set of tools for editing and creating vector images, InkScape is designed with illustrators and artists in mind. It has an impressive feature list and represents a true alternative to Adobe Illustrator or Corel Draw. Like GIMP, it has a large community that is enthusiastic about providing support and developing more features. Unless you want to print one color until the end of time (and plenty of shops have made a killing doing this), you’ll want to invest in software that can help you with color separations. Every color means another screen. These tools will “rip” your artwork and separate it into the constituent parts for a simpler screen burning process. If you’re doing simulated spot color, or 4 color process (CMYK) printing – you will have to spend the time & money to find the right color separation software for your needs. Price: $200 annually. Also offer an Advanced tier at $490 annually. Difficulty: Simple. Short learning curve. Described by Freehand as a “fast, easy and accurate way to instantly color separate and manage vector-style PDF format graphics,” Separation Studio is the screen printing industry’s leader for color separation. It’s not designed as an art creation program, but as a print planning tool – so it’s integrated with both Adobe and Corel platforms. Separation Studio is specifically designed for screen printing, which means power and flexibility specific to printing needs. You can carefully regiment designs according to ink types, the number of screens you’d like to use, and underbasing requirements. For example: you can reduce an over-designed logo with 19 colors into a simpler design that only uses 6 screens. Additionally, Separation Studio has a strong support system in case you run into issues with their software or need guidance with handling your artwork-to-print process. Price: UltraSeps v2 $300, one-time purchase. UltraSeps v3 $500, one-time purchase. Difficulty: Easy, with some learning curve to understand the (many) things it can do. A set of tools for Photoshop and not a standalone piece of software, UltraSeps makes up for its interesting web presence with the power and specificity of the software's functions. Designed by a 30-year industry veteran, UltraSeps has a plethora of capabilities with the screen printer specifically in mind. There are two versions currently available: the older version 2, and the newest version 3. There’s not a huge difference between the versions – the main reason for the update was to change how the software licensing works. Other things like reliability and simplicity have been improved. The feature list for UltraSeps is huge. It does a lot more than just separate colors. It can generate line drawings from images, create accurate flesh tones, generate custom color channels for metallic and neon colors, enhance & repair images and generate RGB color proofs among many other valuable features. Price: $50 or $150 per month, depending on tier. Difficulty: Easy. In-browser separations. Built to be intuitive and fast. Best for: Shops that need a mobile, cloud-based, lightweight solution for separations. Available for PC & Mac. Hailing itself as an “intelligent screen print graphics pre-processing pipeline,” Separo is a new player in the color separation business. Instead of downloading software or utilizing a series of Photoshop plugins, Separo is cloud-based. Separo is standalone software that doesn’t require setup, and can be taken anywhere. They tout the ability to show “soft proofs” to customers even on mobile devices. It is highly automated – just put an image into the software and it returns ink combinations based on the image provided. The cloud-based approach to separation is definitely appreciated. For shops that want to own their software, this might not be the ideal choice. But if you’re interested in a fairly straightforward and lightweight separation process, Separo could be a solid solution. Best for: High-quality printer management, creating very good transparencies for burning screens. Available for Mac & PC. AccuRIP is not color separation software: it acts a translator between your Epson inkjet printer and your Adobe or Corel art files. Without RIP (raster image processor) software, your transparencies won’t print as well. According to Freehand, “AccuRIP [...] reads your art files instantly and translates them into solid areas, tints, and gradients/blends.” Burning good screens requires good transparencies, and a program like AccuRIP facilitates the process. AccuRIP is extremely simple to use. It lives in your existing Print dialog menu – you just select the channels you want to print & let the software talk to your printer. Since it’s designed with screen printing specifically in mind, it’s formulated to create extremely professional quality transparencies. You can reliably print more complicated designs and create far more interesting color effects with RIP software. Freehand also offers a variety of inks and printing supplies to support AccuRIP. While this software is costly, it’s extremely difficult to imitate its results. It’s also been under development for a long time (so it’s trustworthy) and has an excellent support team. There are multiple ways to manage your screen printing shop. You can run it off a blackboard or use paper printouts – but there are much faster, easier and simpler ways to manage day-to-day administration. There’s also software that helps with communication, bookkeeping and other common problem areas. If you have employees, you owe it to them (and yourself) to use software to streamline and simplify each area of your business. You can always opt for a non-industry project management solution like Monday or Asana, but they’re not designed with print shops in mind. I use Printavo in my shop – it’s specifically made with the garment decoration industry in mind. With Printavo, you can manage many of the things unique to this industry: shop workflow, pre-production tasks, order intake, attractive quote & invoice generation and the biggest single time sink of all...art approval. 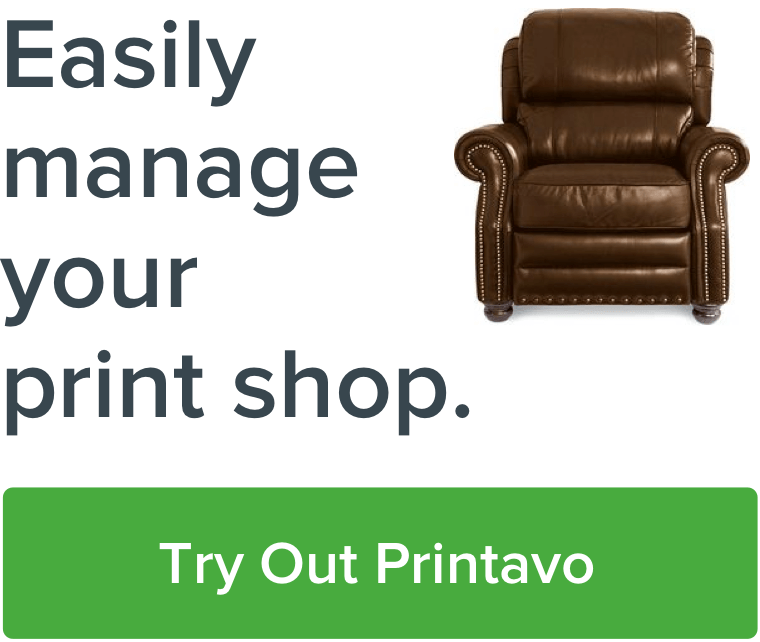 Outside of Printavo, there's software to make your life even easier. Price: $10/mo for the bare-bones plan. Quickly rises to more than $100 with full features. Difficulty: Moderate. Mild learning curve. Best for: owners & operators. Available for: Mac & PC. Hopefully you're already familiar with QuickBooks! As Adobe is to design & art, Quickbooks is to small business accounting. You can manage your cash flow, receivables, taxes, payments, bills and more. They claim that you’ll save an average of 40 hours per month – but it does require an up-front investment to get everything set up. Coolest of all, Printavo links up directly with Quickbooks for superpowered shop administration. Cost: $5-10 per month, per user. Difficulty: Easy. You probably use it already. You can bolster your image online and keep the awesome functionality that Google’s services offer if you move to Gsuite & use a branded email address. No more personal email address for customer-facing communication! You’ll also get access to the entire Google productivity suite. Gsuite is highly compatible with numerous CRM tools, and is the go-to standard that many people expect. The stability of Google’s cloud-based services is a big plus for operational consistency. Difficulty: Easy, but requires some creative thinking. Zapier helps you automate complicated or time-consuming rote tasks by making web apps talk to each other. In plain English: Zapier lets you connect apps that normally don’t talk to each other. Since there are so many routine & repetitive tasks that you’ll need to consider when you manage your shop, it’s a versatile & powerful tool. It can take your process to the next level! It’s simple enough to use. The challenge is finding creative ways to implement it! Luckily, there’s a large community and plenty of content around what you can automate. Zapier doesn’t have to cost money – if you only use it in a (very) limited way. If you calculate the time you save by automating troublesome processes, it is absolutely worth its monthly price. Yes, shipping is a headache. It’s expensive, time-consuming, risky and generally just a pain to manage. There’s still a few services that help get your goods shipped on time, at a lower price – and save you trouble. We're just skimming the surface here, so take a good look at the options for shipping software. Price: Varies according to usage. Best for: Simple & fast shipping with USPS, printing your own labels. The official licensed vendor for the United States Postal Service, Stamps.com lets you create shipping labels really quickly. If you want to use another service like FedEx or UPS, you'll have to find another option. It connects to a large variety of e-commerce platforms. Price: Varies from $10 to $160 per month depending on volume. Best for: Shipping automation, label creation, using carriers besides USPS. ShipStation has focused on automating shipping-related tasks & reducing the process into its simplest parts. They work with hundreds of e-commerce integrations. Screen printers will like ShipStation because it lets you white-label shipments for contract printing. It's also a highly functional shipping platform that lets you control virtually everything about your shipments. Price: 1 cent per package. Difficulty: Low, but some setup involved. Best for: Extensive logistics and shipping work, connecting directly to Printavo. Easypost is an API for all things shipping: tracking packages, making labels, even insuring shipments. You can use Easypost to print shipping labels directly from Printavo. For one cent per package, you get a seamless shipping experience from your production environment. Each area of managing your shop comes with its own complications that require a lot of time & energy to deal with. Software has a learning curve: you have to be bad at it for a while before you can be competent. But: that time is an investment in your overall competency. Instead of worrying that software is a burden, remember that it's an opportunity to refine what you do and how you do it. Training and practice are how you'll take things to the next level. Even when your screen printing shop is well established, and your actual printing process is dialed in, new software can come along and change the game.